It was a few years ago now, we were playing in a 5 aside tournament in Perth (Scotland). A couple of guys lived locally but most lived about 30 miles away. Anyway we had a company car so we drove there. The tournament was going well, we played some good football and made the quarter finals. We were losing and just before the end of the game I took a shot and, as I did, their big defender caught me right on the ankle. Instant pain! It wasn’t broken but my immediate thought was that the ligaments had gone as I could put little or no weight on it. Anyway, the tournament finished and we went to the pub for some liquid refreshment. By this point my ankle was throbbing and I had be helped into pub. The pain was so bad that I couldn’t bear even to drink a pint, so ended up with a diet coke and a couple of Ibuprofen! It didn’t stop my teammates though. So the beers were flowing and, after a few rounds, out of nowhere came the “who’s driving home then” line!!!! Everyone looked at each other then all eyes descended on me. Of course I was sitting on a chair with my foot up and a towel of ice on my ankle! Somehow, I was the designated driver, yet nobody had made the connection that I’d be unable to perform my duty!! I couldn’t even walk so had no chance of driving home as I wouldn’t be able to use the accelerator. So we got back to the car, there was no way I could drive. Now, as this was a company car, it was packed with essentials: jackets, umbrellas etc. Bizzarrely, someone suddenly came up with the thought that it would be a good idea for me to use a brolly (note: that’s a British term for ‘umbrella’, for anyone reading outside of the UK) for the throttle! Not a great idea, but it was all we had. 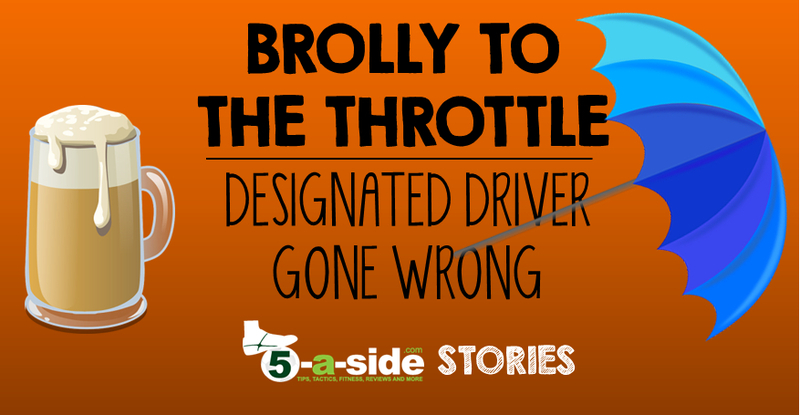 Now try and imagine changing gear whilst pushing/pulling a brolly on/off the accelerator!! It’s not recommended, that’s for sure. You’ve never heard a car scream so much as we did that night!! Fortunately most of the journey was dual carriageway but it was still a precarious task. The next day the hospital confirmed that I had torn my ankle ligaments. The things you do for a game of 5’s!! Thanks to Rosco for submitting this one. That’s how easy it is to do a great story! If you’re reading this and have got a tale to share with us, get your submission to us on the stories page now. Loving these stories. Keep them coming.